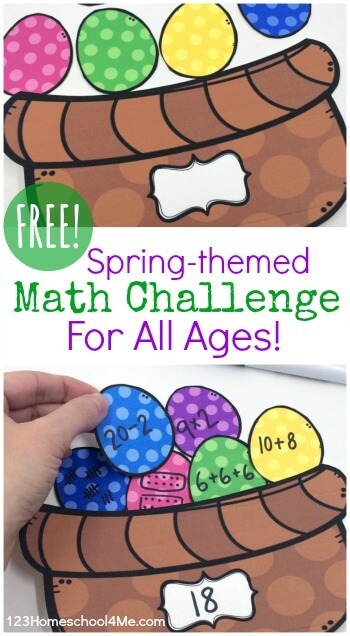 Help your kids use the math they’ve learned to complete this fun, FREE printable Easter Basket Math Challenge. 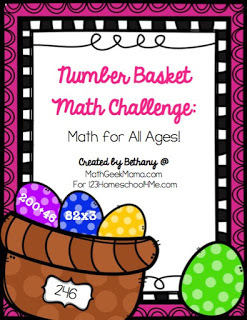 This is great for math fluency with kids of all ages. I often find that when Spring comes, I’m ready for something different. Even if it’s just for a day, a break from the normal math routine is a fun and welcome change. 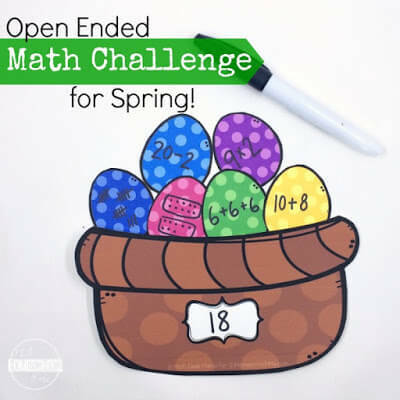 Because I homeschool, my kids are all at different grades and abilities, so finding a math challenge that can involve each of them together can be a bit of a challenge. But they loved this Number Basket Math Challenge! Because it’s so open-ended, it’s a great, mind-stretching activity that all ages can enjoy. The basic premise of this challenge is to come up with a variety of different ways to represent any given number. 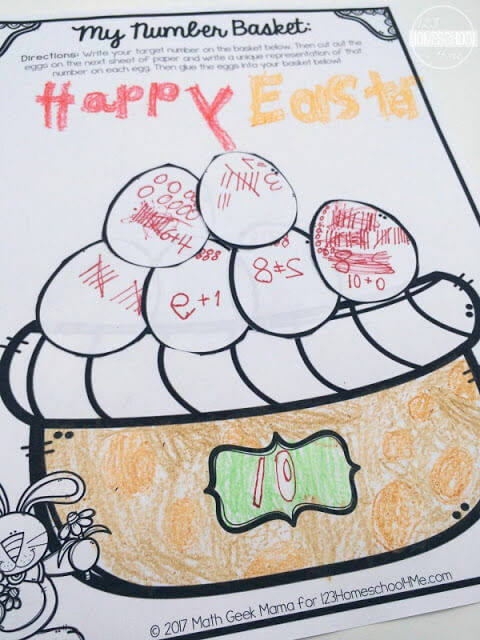 Students will write their number on their basket, and then write different representations on their eggs to fill the basket. For example, if your number is ten, you could represent it as 5+5, 20-10, tally marks, dots, 2×5, etc. The wonderful thing about this challenge is that any age can participate. Young kids can focus on smaller numbers, visual representations and addition/subtraction facts. Older kids can really be challenged to think outside the box with their answers, or be given a large number, or be given a fraction, decimal, etc. 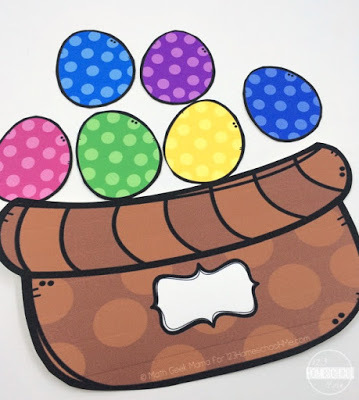 Color printable set with a basket and 6 colorful eggs – I would suggest you laminate this set and let students write their answers with fry erase marker to use again and again. This would make a great math center activity or a fun, quiet challenge for early finishers. 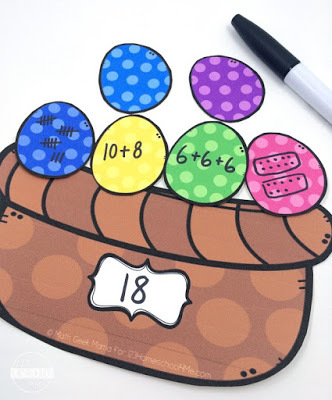 Black and White cut and paste version – print a “My Number Basket” page and set of eggs for each student. then assign a number to everyone. (You can either have everyone use the same target number and see how many unique solutions you come up with as a class, or you can assign different numbers.) To assign every student their own number, you can draw out of a hat, or use a random number generator (on a graphing calculator or at random.org). Once students have written a different representation on each egg, they can cut them out and glue them onto their basket. Then they can color and decorate their page! Or you could print the color version for each kid and let them cut it out and glue the completed basket on construction paper. 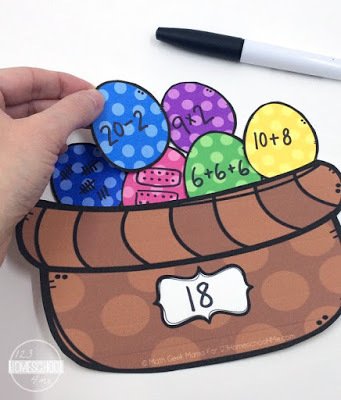 Then display everyone’s number basket around your room or staple to basket to your bulletin board to use with your “number of the day.” Then give each student an egg (you’ll need to print multiple copies) and have them each come up with their own representation of that day’s number. Or anything else you can think of, as long as the solution is equal to your target number!